• Get protection from extreme temperatures, vibration, dust and high altitudes with MIL-STD-810G tested laptops. • Look sharp while working hard thanks to the Dell Tri-MetalTM chassis with a brushed aluminum finish and reinforced magnesium alloy wrapped corners. • Worry less about making a mess with the spill-resistant keyboard and LCD protective seal that helps to form a barrier around your LCD panel when closed. • Communicate effectively worldwide with optional built-in webcam, array microphones and a high-performing antenna for ideal mobile broadband connections. Enjoy seamless integration into your IT environment and rest easy knowing that Latitude E-Family laptops-and your company data-are secure and protected anywhere in the world. • Know your data is secure with Dell’s Data Protection | Encryption11 and encrypted hard drive options. • Protect your data from the unexpected mishaps with Dell Fast Response Free-Fall Sensor and StrikeZoneTM. • Control who has access to your data with Dell ControlVaultTM, Dell Data Protection | Access, contactless smart card and fingerprint reader login access options. SD Card Reader, Smart Card Reader, HDMI Out, VGA Out, eSTATA Port. I am giving this laptop 5 stars, as this really is a great value overall. On the positive side, my “refurbished” laptop arrived in extremely great shape, with no discernible scratches and fully functional. I went ahead and checked the internals as well, (not for your average home user), and it was very clean. My particular unit was manufactured in May of 2012, and I am thinking it did not have a lot of mileage to it. It does come with a new clean installation of Windows 7 64 bit Professional, ready to boot up and install. The battery seemed in good shape, and passed the Dell website battery diagnostic test. In addition, while these machines are out of original warranty, (3 years), the Dell website is full of easy to use support options, even offering an extended warranty if you wish to pay for it. 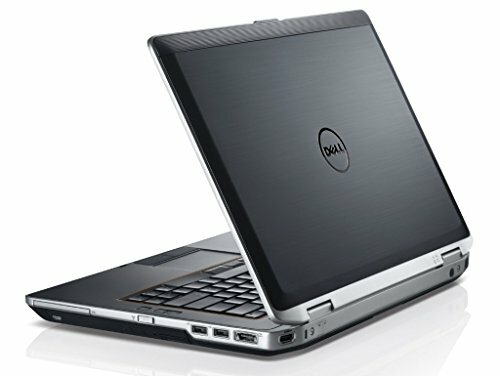 A machine like this, refurbished from Dell proper, will run $700 to $800. You might want to read the reviews on the Dell E6420 on the Web, as it is a robust laptop, made for travel and not made of egg shells. Fantastic machine. On the critical side, my unit came with the i5-2410M Intel Sandy Bridge processor, and not the i5-2520, (as advertised), and the i5-2410M is slightly slower, with a base of 2.3 Ghz., and turbo boost (sustained) of 2.8 Ghz. In addition, the 4 GB of RAM, (2 x 2 GB modules), were miss matched in speed, so they were only running at 533 Mhz, and not 667 Mhz. I went ahead and changed them out to new 2 new Corsair RAM modules at 4 GB, for a total of 8 GB dual channel memory, now running at 800 Mhz. I was not crazy about the old Samsung 128 GB SSD that came with the Laptop, so I changed it out to a new Toshiba 256 GB Q Series Pro SSD, and I ran an additional clean install of Windows 7 64 bit Professional. The new RAM and new SSD made a reasonably fast laptop even faster. You can use this laptop for very demanding applications without the computer lagging or slowing down. The only area this laptop might fall short on would be for intensive graphics associated with complex PC games, 3D rendering, or intense video editing. For most business and home applications, this laptop will more then keep up. Keep in mind, that if you need any additional drivers or support, you can get it all at the Dell website. I went ahead and updated the BIOS and checked for the most up to date drivers off of the Dell website. Also, be prepared to take some time on the first install of Windows 7, that there will be about 200 to 220 updates needed almost immediately once you get the machine up and running and hooked up to the Internet. On the bright side, you did not get a new laptop with a “ton” of stupid bloatware and junk you did not want or need. These Dell Machines do come in slightly different configurations, and are being sold by different secondary vendors. Mine came from TechHarvard, but there are 2 or 3 other vendors selling these as well under this same heading. While I feel very positive about buying this refurbished laptop, and I know I got an excellent value, individual results may vary. Quite frankly, I would buy this machine again, and I would buy this refurbished Dell laptop ahead of most of the new junk that you can find in the Retail stores. If you are on a budget, and you need a great laptop, you could not go wrong buying this unit. If you are not on a budget, go ahead and get the new Dell E6440 laptop, but be prepared to fork over $1,200 or so for the privilege. Trust me, the Dell E6440 is not going to perform much better then this refurbished E6420, and if the new E6440 comes with a standard hard drive instead of an SSD, it will be a slower machine. If in doubt, just buy it. (Edit and Update Jan 2017). I did go ahead and upgrade this Laptop PC to Windows 10 Pro, during the Summer of 2016. I am happy to share that I ran into “Zero” issues with the upgrade, and had no driver issues. Even at this particular time of update, a year and a half after I have purchased this machine, it is still running strong and it is a better value than the Laptops you might get at a Big Box Store. FYI. Certainly meets my expectations as a refurbished computer. I would say it is much closer to “New”. Not a single wear mark on the machine anywhere. Performance is more than adequate, and the solid state hard drive is absolutely a huge win for performance. I will be installing an additional 4GB of ram into mine although it performs perfectly with the 4 already installed. Rigged design, feels solid and runs as many applications as I need to at any given point in time.